A Memoir by Charles H. Moore Jr.
Watch this space for additional information regarding Running on Purpose, SVC developments, stories from Charlie and more. Perhaps, it was through my experiences of leading and inspiring CEOs as executive director of CECP that I came to realize that global CEOs and their companies have the opportunity, and the responsibility to advance solutions to solve the world’s greatest societal challenges. Or maybe, it was much earlier, at age 22, when I won a gold medal and set the Olympic record in the 400-meter hurdles in Helsinki in 1952 that sparked a sense of perseverance and passion for long term goals that has carried through my life, and has emboldened me to offer a call to action to both today’s and tomorrow's businesses. Whatever, at age 88, I look back at a full life of purpose, which prompted me to write a business memoir, Running on Purpose: Winning Olympic Gold, Advancing Corporate Leadership and Creating Sustainable Value. It is the story of my multifaceted personal and professional journey intended for those who care about building better teams, better companies and a better world. It reflects my understanding of the importance of balancing financial success with social and environmental impact, while treasuring the value in investing in the arts, education and building resilient communities. Finally, I have shared my insights for guiding twenty-first-century global business. My call to action is built on five premises which have only one outcome. Businesses are not playing the game or following the rules we need them to. The new game is one based on sustainable value creation (SVC). It is one based on corporate purpose and is strategically deeper than financial evaluation can measure. As a new game, it requires a new and simple frame of reference that is shared by all players. We need to understand the combined effect of what a company deems material to its sustainable value equation and how results relate to those of other companies. There is important groundwork available to help identify some of the fundamentals of sustainable value creation. We must all do our part. A successful outcome will result from the acceptance and execution of the second and third premises: Long term value creation must be at the center of everything! And I advocate a system that measures both economic and social values, and allows us to integrate these measurements of benefits into financial valuations and business decisions. I believe that companies don’t have to chose between profit and sustainable value. Our capital markets operate under the assumption that investors are economic actors who want the best return they can get for the risk they are taking, and ignoring sustainability heightens the risk for investors. The reality is that current initiatives and standards were developed to satisfy external stakeholders, not to manage a business. There are already too many players and standards, but there is still no playing field for progressive companies to compare themselves to or learn from other leaders — which should be encouraged by their boards. They lack both a standard for measuring intangible assets and a clarity in defining a path to value. Anything we create of substance or meaning in this life relies on choices that are consistent with our deepest values. I firmly believed this as I promoted a major turnaround in business thinking. We are close to changing how global businesses navigate the future in cooperation with the broader opportunities of societies. That’s what the “license to lead” is all about! "Running on Purpose by Charles Moore is one recent book that really connects with me and the way I try to approach life and business. I think it is very important to find something you can be part of that is meaningful to you, that you're passionate about, that gives you the psychic income that comes from a larger goal than just numbers on a spreadsheet. The Coca-Cola business is about providing people with simple, affordable moments of refreshment and connections with others. I've always been inspired by that basic mission. In addition, we can make a positive difference for our people, partners, retailers and communities. And hearing their individual and collective stories has kept me motivated and eager to do more and make more of difference every day." Charlie was recognized in the December 2017 issue of 5 Great Lions, a publication of Lion's Club International. You were so kind to send me a copy of Running on Purpose which I had the pleasure to read on a flight yesterday from London to Denver. Thank you so much for generously sharing your amazing life story and passing on the wisdoms along the way. Lots of valuable life lessons for all of us. It was Simon Peres who told me that you stay young when the list of things to do still is longer than the list of what you have done. You certainly live by that principle. Also great to see the loving and supporting family as part of your success. You are right to recognize in your own humble way. The work you did with CECP is most admirable as we need indeed more purpose driven companies. Once again you were kind to share. Wishing you all the best. Interview with Charles Moore featured in the Spring 2017 issue of The CEO Forum by Robert Reiss, host of The CEO Show and co-author of The Transformative CEO. Interview with Charles in the July 2017 issue of LEADERS Magazine. The Olympian, official newsletter of the U.S. Olympians, reviews Running on Purpose. See the free digital copy here. Charlie's alma mater features the release of Running on Purpose in the Summer 2017 Edition of Mercersburg Magazine. 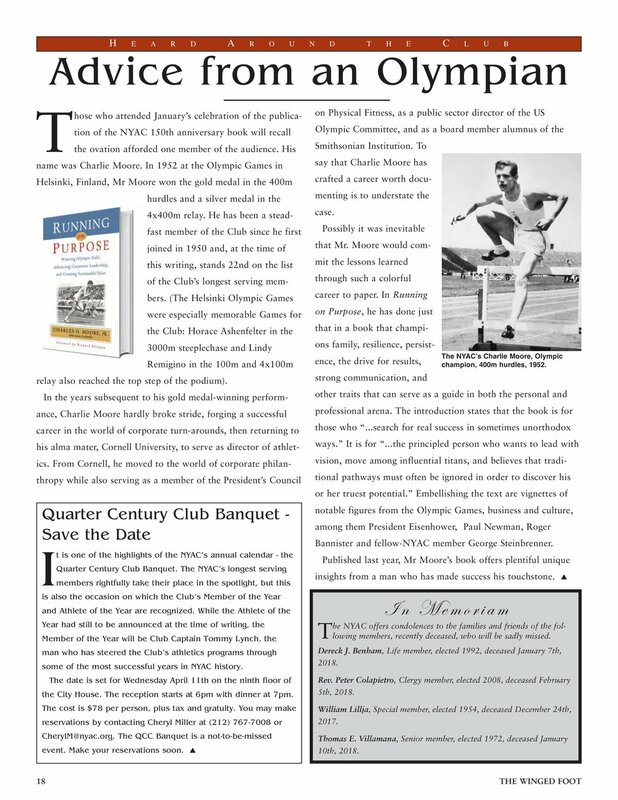 Charlie's feature of Running on Purpose and One Hurdle at a Time in the Westmoreland Club Magazine. Follow Charlies's traveling adventures by clicking here!